The range of SEB cable drum trailers are equipped with braking and road lighting systems to conform with EEC Directives and are designed to travel fully laden at road speed - for safe and easy cable drum handling all SEB cable drum trailers are fitted with hydraulic hand pump operated lift/lower systems as standard. When the cable drum is lifted and raised, mechanical locks ensure cable drum security in transit - suitable for LV, HV, EHV, fibre optic, street lighting and rail cable pulling and cable laying installations. T&D meet the cable drum trailer requirements of the DNO, utility and cable laying contractors enabling underground cable installations within the LV-HV power and telecommunications industries. Cable drum trailers are available for low and 11-33kV high voltage cables, street lighting cables, BT cables and fibre optic cable installations. All of the cable drum trailers are equipped with braking and road lighting systems to conform with EEC Directives and are designed to travel fully laden at road speeds indicated on the UK Highway and most other European countries. Cable drum trailer variations can also be made to accommodate any individual country specific specific requirements. For safe and easy drum handling cable drum trailers are fitted with hydraulic hand pump operated lift/lower systems as standard. When the drum is fully raised mechanical locks ensure drum security in transit. Designed and supplied specifically for ''Off Road Use'' cable drum trailers are all fitted with some form of brake system, hand parking facility and basic vehicle lights. Although not built to conform with EEC braking/lighting directives certain non EEC countries have operated these cable drum trailers on the highway under the proviso that towing speeds indicated must not be exceeded. As drums of LV-HV cables get larger reducing the number of cable joints required, Site range cable drum trailers have expanded to accomodate drum sizes of up to 2800mm wide and 5000mm dia with a maximum payload of 48000kgs. In December 2009, Balfour Beatty Utility Solutions (BBUSL) approached SEB for a cable drum trailer to cope with a high voltage drum, which weighed 50,000Kg. The cable laying and pulling project was an underground tunnel from Croydon to Beddington and the overhead power cables were being taken down and replaced by 400kV cable, which was running through the cable tunnel to severely reduce the cost of future maintenance and upkeep. 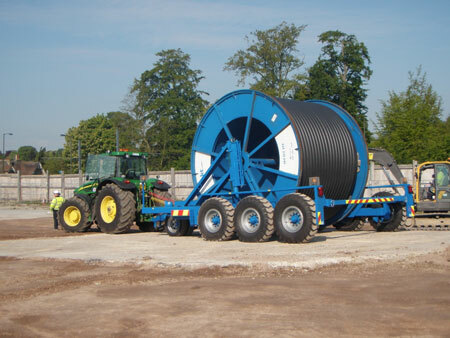 This cable drum requirement was in 40 years of manufacturing the largest project SEB had ever been asked to take on, the high voltage cable drum was 4500mm in diameter and 3700mm in width, which made the overall width of the cable drum trailer 5200mm. The cable drum trailer was delivered in the middle of 2010 and the cable laying project was completed in early 2011, the drum trailer operated successfully and the client was very happy with its performance.